At the elegant mooncake-testing at St Regis, our little group discovered we were closer knit than we knew - we had not six degrees of separation but just one! It was an evening of amazing discoveries! Thus united, with high spirits (or more likely a sugar high) and teas sloshing about in our stomachs, we adjourned elsewhere for some "light bites" and further conversation. 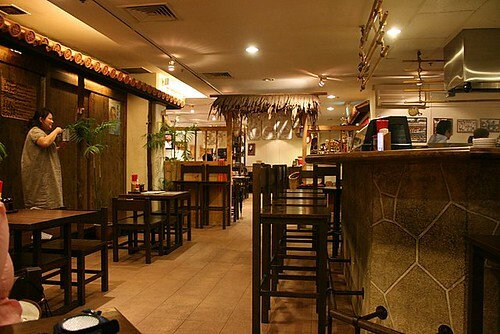 The lure of chicken wings was close by but Jerry's Barbeque & Grill at Tanglin Shopping Centre was closed. So we headed up to Nirai Kanai for some Okinawan grub. To be frank, I had initial reservations about Nirai Kanai, having heard that it was closer to Chinese food than Japanese, and that a lot of dishes are bland. Which is why until that evening, I have not been tempted to step in. My, I have been missing out on some good stuff! Yes, the Chinese influence is somewhat there. 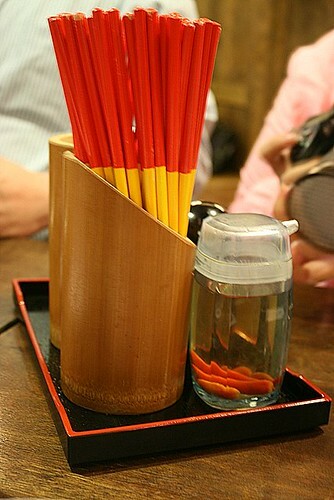 Even the chopsticks are painted in Chinese temple hues. But the food is not bad, some of it. Of course, the company helped elevate things. Food always tastes better when you're having a blast - laughter is the best sauce after hunger! Anyway, the name Nirai Kanai itself is quite interesting. In Okinawan mythology, it refers to a magical land across the sea where the gods live, and where all things originate. The gods are thought to come to bless the Okinawan islands once a year. The people still welcome the gods through rituals and festivals. But yes, back to the "light bites"...we ended up ordering and eating quite a bit, as you will soon see. The menu is quite extensive. I took some shots to take home and pore over at leisure to see what else I might like to come back for. They are quite well-known for their peanut tofu in sweet soy sauce. 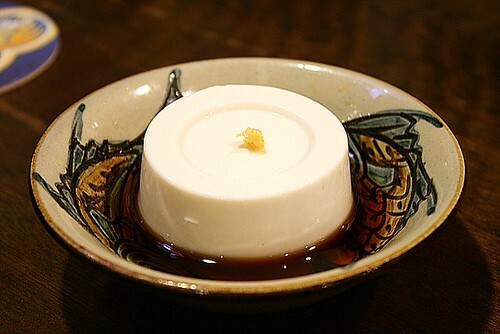 The texture is firm and dense, more like that of mango pudding than tofu. But the peanut fragrance is unmistakable. It was surreal. 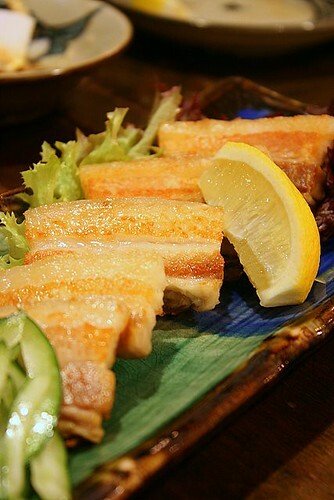 Pork reigns supreme at Nirai Kanai. Their signature braised pork belly looks good but I was told it's not that great. We had the grilled pork belly with salt instead - in fact, three servings of this! Lightly crisp on the edges but as you can see, there's more fat than meat! Delicious but a little too rich for me. 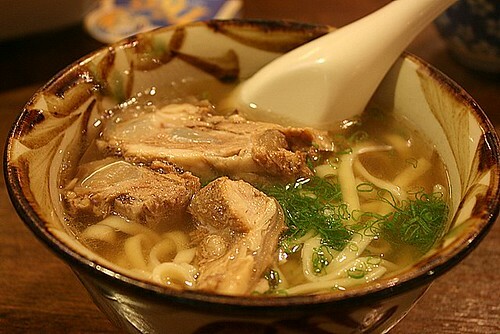 Ah, the pork rib noodles in soup. Where do I begin? Chunky, fall-away soft pieces of sweet, flavourful meat along with soft bones stewed until really soft (proof of hours of stewing or braising). The soup is a rich dashi and chicken stock. You can really taste the katsuobushi (bonito flakes) that went into the production of this. Plus Japanese style mee-pok to soak up all the tasty goodness. Grilled ox tongue. By the time all of us finished taking photos of this dish, I think it turned cold a bit. But later we ordered another and it was still a bit cold. Odd. But the marinade is tasty and the tongue, well, naturally chewy. To some, bovine tongue on (your) tongue action is unsettling. But MilkMilk lapped it all up! 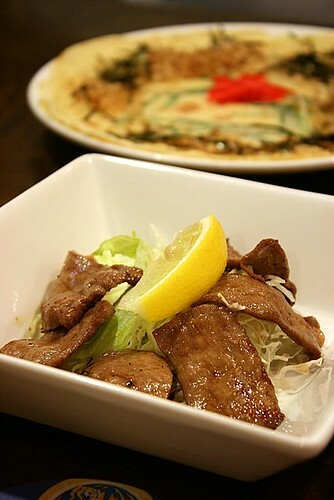 That platter behind the ox tongue is the Okinawan pancake. Pretty much the disappointment of the evening. It was a thick, rubbery sheet with unyielding whole scallions within. None of the toppings could save this. 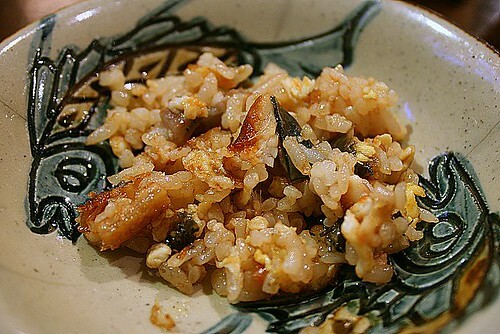 Ah the fried rice with unagi and egg. My favourite of the evening! FLAVA! Umami! It's like garlic rice that got upgraded to first class! I forgot to take a photo of the whole dish, so I only have this tiny tasting portion to show. Next time I am having one whole bowl to myself! 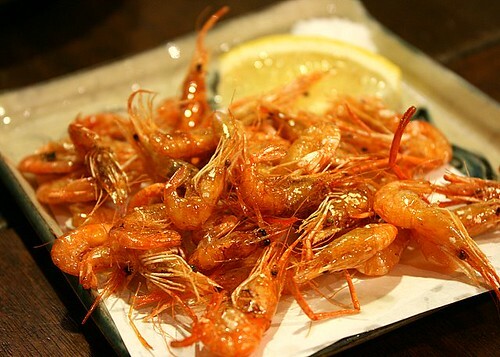 Deep-fried river shrimp with salt. Although pretty much stuffed, we still had room for one last "light bite" - it looked really good on a waitress' tray going to another customer. We had to try this. Very crunchy way to get all your calcium needs. On their own, they are a little bland, but the flavour really blossoms when you eat it with the salt and lemon. There was a Japanese lady manager who exhaled a "Sugoi!" at all five of our cameras capturing the food. A big part of the clientele seem to be Japanese too. In fact, I think locals were outnumbered. I always take that as a good sign. Their website is also quintessentially Japanese. I should like to come back and try the other eats. lurve the sharpness and clarity of your pictures. sugoi indeed! you all ordered so much and called that "light bite"? lol! Nic: thanks! usually only my first photo is clear. the rest will be blurry cos I'll be impatient to eat! hahaha! yes, Nirai Kanai is worth a try. LIC: that is why I have quotation marks around my "light bites" - hahaha, what do you expect when a group of foodies go to eat? 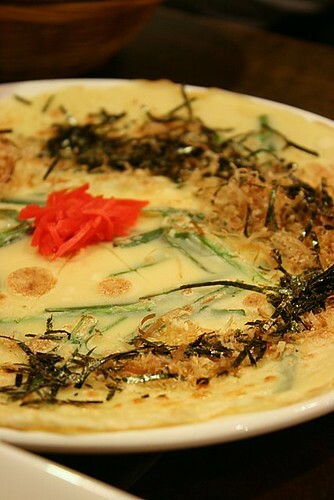 I always wanted to try Okinawan food as I didn't have a chance to visit the island yet. It seems like this is where I should go! I am going to Okinawa next week! Hurray! Let's see how the food there compares!